San Francisco, Calif. – February 28, 2011- However ubiquitous All Purpose Flour may seem, it is one of the most sought after ingredients by individuals who rely on emergency food boxes to feed their families. 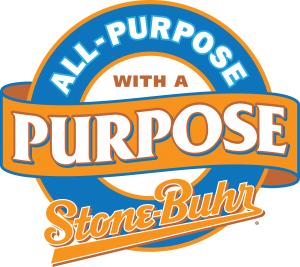 Recognizing this need, Stone-Buhr, a 100 year-old wheat flour brand based in the Pacific Northwest, aims to give away up to 100,000 pounds of flour in 2011 through its new All Purpose with a Purpose initiative. Starting today, every purchase of Stone-Buhr Flour by a customer will trigger a flour donation to partner food banks located in Oregon, Washington and Northern California. Stone-Buhr is kicking off the All Purpose with a Purpose program by donating an initial 10,000 pounds of flour to Oregon Food Bank, Northwest Harvest and Spokane Valley Partners Food Bank in Wash., and San Francisco Food Bank. Each quarter, based on sales, additional pallets stacked high with five-pound bags of Stone-Buhr All Purpose flour will sift their way into thousands of food boxes. Donations will be tracked on Stone-Buhr’s website and on the company Facebook page. Stone-Buhr is distinguished for its support of regional family farmers and sustainable agriculture. Two years ago, the company began selling the first Food Alliance certified All-Purpose Flour grown by Northwest family farmers who are responsibly managing their land with no-till farming practices. At the same time, Stone-Buhr launched a special website, “Find the Farmer” (www.findthefarmer.com), designed to re-connect home bakers with the source of their flour and teach them more about these impassioned farmers. Now home bakers who use Stone-Buhr flour will not only be supporting Northwest farmers who are dedicated to no-till and direct-seed practices that are good for the soil, air and water, but will also be helping to feed hungry families. Available in major retail grocery stores throughout the Western United States, Stone-Buhr All Purpose Washington White is the only major wheat flour product to be certified sustainable by Food Alliance, the nation’s leading third-party certifier of agricultural producers and processors. Other products sold under the Stone-Buhr label include the leading 100% Whole Wheat Flour, milled from the entire spring wheat berry, promising 100% of its fiber and nutrients and Unbleached White Bread Flour from 100% hard red winter wheat. Packed with flavor and protein, this flour is ideal for bread baking. Additional information and track-ability is available on Stone-Buhr’s Find the Farmer website, which invites customers to enter a unique code from their bag of flour in order to meet the family farmers who grew the milled wheat inside.